Keeping up with the weather in Kitchener can be tough and during the winter months, it can feel like a full-time job. If you don’t have the patience, time or are just unable to keep up with snowfall and melt in your area, call our Gorillas. 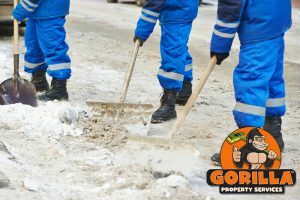 All on your own, your Kitchener snow removal and salting might seem like a lot of work, but our Gorillas can help take the sting out of this chore. The first few days of winter can be nice. There are cool breezes in the air, and it is always nice to make a cup of hot cocoa and binge-watch some movies. The later days, however, can be difficult. No one wants to wake up in the morning to a freshly fallen pile of snow. Digging yourself out of a landslide of snow can set a negative tone for your whole day. 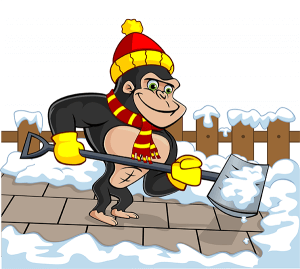 Instead of suffering through snow falls and shovelling, let our Gorillas lighten your load with our Kitchener snow removal and salting. Removing mounds of snow is not only a chore but it is mandatory. In many areas of Canada, it is illegal to let snow pile up on your property. Skipping a few days of shovelling might not seem like a big deal but it can results in fines from city by-law officials. This is annoying enough if you are a home owner but for business owners, it can be a huge headache. Having snow piled up around the entry way to your storefront, restaurant or business can deter potential customers from coming inside. Let our Gorillas handle the negative side of your winter wonderland, so you can take advantage of the good. A good Kitchener snow removal and salting service provides not only a clean space, but the peace of mind to go with it. Because snow is most likely to fall during late night or early morning hours, our Gorillas are always on the go, even offering emergency call out services. If a snow storm of flurries has covered your property in the night, you can bet that our Gorillas will be there to clear it away for you. Don’t worry though, no matter the time of day or night, you will be able to recognize our Gorillas by our brightly coloured outfits and vehicles. If you are dreading the first snow falls of winter or are already up against a pile of snow or sheet of ice, our Gorillas can help.